The Sepang International Circuit, which is renowned as the home of Formula1 in Malaysia, gets ready to host another electrifying event this weekend- the Shell Advance Malaysian Motorcycle Grand Prix. This event is scheduled for October 11th to 13th 2013 and promises to be another sure-fire hit. 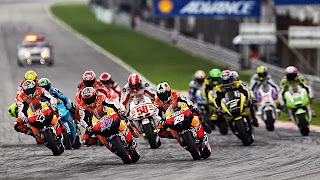 In fact, the 22nd edition of the Malaysian Motorcycle Grand Prix hosted by the Sepang International Circuit in 2012, was recognized as the MotoGP event of the year by Dorna. The event drew huge crowds, of approximately 77000 on each day and this number is expected to be surpassed this time around. If you live and breathe Moto GP, then you can’t afford to miss this thrilling event, which constitutes round 15 of the 18-leg MotoGP World Championship. The tourney is currently at an extremely exciting stage as Tuenti HP 40’s Pol Espargaro is attempting to overhaul championship leader, Marc VDS Racing Team’s Scott Redding. A mere 20 points separate the two champion drivers, with Espargaro having bested the Brit last time in Aragón. This time around at Sepang, Redding will no doubt try to strengthen his grip on the title. These two champion drivers will be challenged by several other excellent riders like Aspar Team Moto2’s Nico Terol, Espargaro’s own teammate Tito Rabat, Alex Mariñelarena who is racing for Blusens Avintia and Thai rider Decha Kraisart, who is racing for the Singha Eneos Yamaha Tech3 outfit. Local fans will be keen to have their own Hafizh Syahrin (Petronas Raceline) make the podium this time around for he narrowly missed out on the achievement in 2012. Other Malaysians in the fray include local hero Muhammad Zulfahmi Khairuddin who represents another podium hope in the Moto3 Category. Also, attracting much attention is Malaysia’s latest racing outfit, the Touchline SIC AJO Racing Team which will feature Amirul Hafiq & Husni Aizat, as Moto3 Wildcard Entries; and current SuperSports 600cc category ARRC championship leader, Azlan Shah Kamaruzaman, who qualified for the event on merit. Aside from electrifying races, the 2013 Shell Advance Malaysian Motorcycle Grand Prix will feature various other attractions like the Ducati Club convoy on race day, the 13th October and more than 60 kiosks featuring various vendors including many of the world’s leading bike manufacturers. The event will also offer ticketholders the chance to see all their idols in person at the autograph signing session scheduled to be held at the Welcome Center on 12th October.